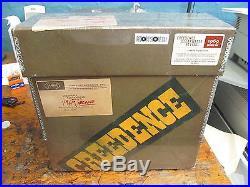 Creedence Clearwater Revival – 1969 Box Set [New Vinyl] With CD, With Bonus 7, Boxed Set. Artist: Creedence Clearwater Revival Title: 1969 Box Set Item Condition: New and unplayed Format: Vinyl Release Date: 2016 Label: Fantasy UPC: 888072361539 Genre: Rock. Album Tracks DISC 1: 1. Green River Creedence Clearwater Revival 02:34 2. Commotion Creedence Clearwater Revival 02:44 3. Tombstone Shadow Creedence Clearwater Revival 03:39 4. Wrote a Song for Everyone Creedence Clearwater Revival 04:55 DISC 2: 1. Bad Moon Rising Creedence Clearwater Revival 02:21 2. Lodi Creedence Clearwater Revival 03:13 3. Cross-Tie Walker Creedence Clearwater Revival 03:20 4. Sinister Purpose Creedence Clearwater Revival 03:22 5. The Night Time Is the Right Time Creedence Clearwater Revival 03:08 DISC 3: 1. Born on the Bayou Creedence Clearwater Revival 05:16 2. Bootleg Creedence Clearwater Revival 03:02 3. Graveyard Train Creedence Clearwater Revival 08:37 DISC 4: 1. Good Golly Miss Molly Creedence Clearwater Revival 02:42 2. Penthouse Pauper Creedence Clearwater Revival 03:39 3. Proud Mary Creedence Clearwater Revival 03:08 4. Keep on Chooglin’ Creedence Clearwater Revival 07:41 DISC 5: 1. Down on the Corner Creedence Clearwater Revival 02:46 2. It Came Out of the Sky Creedence Clearwater Revival 02:54 3. Cotton Fields Creedence Clearwater Revival 02:56 4. Poorboy Shuffle Creedence Clearwater Revival 02:27 5. Feelin’ Blue Creedence Clearwater Revival 05:05 DISC 6: 1. Fortunate Son Creedence Clearwater Revival 02:19 2. Don’t Look Now Creedence Clearwater Revival 02:10 3. Midnight Special Creedence Clearwater Revival 04:13 4. Side O’ the Road Creedence Clearwater Revival 03:21 5. Effigy Creedence Clearwater Revival 06:25 DISC 7: 1. Wrote a Song for Everyone Creedence Clearwater Revival 04:55 5. Bad Moon Rising Creedence Clearwater Revival 02:21 6. Lodi Creedence Clearwater Revival 03:13 7. Cross-Tie Walker Creedence Clearwater Revival 03:20 8. Sinister Purpose Creedence Clearwater Revival 03:22 9. The Night Time Is the Right Time Creedence Clearwater Revival 03:08 DISC 8: 1. Graveyard Train Creedence Clearwater Revival 08:37 4. Good Golly Miss Molly Creedence Clearwater Revival 02:42 5. Penthouse Pauper Creedence Clearwater Revival 03:39 6. Proud Mary Creedence Clearwater Revival 03:08 7. Keep on Chooglin’ Creedence Clearwater Revival 07:41 DISC 9: 1. Poorboy Shuffle Creedence Clearwater Revival 02:2 5. Feelin’ Blue Creedence Clearwater Revival 05:0 6. Fortunate Son Creedence Clearwater Revival 02:1 7. Don’t Look Now Creedence Clearwater Revival 02:10 8. Midnight Special Creedence Clearwater Revival 04:13 9. Side O’ the Road Creedence Clearwater Revival 03:24 10. Effigy Creedence Clearwater Revival 06:25 DISC 10: 1. Bad Moon Rising Creedence Clearwater Revival 02:16 2. Proud Mary Creedence Clearwater Revival 03:11 DISC 11: 1. 1 Creedence Clearwater Revival 04:39 2. I Put a Spell on You Creedence Clearwater Revival 04:33 DISC 12: 1. Fortunate Son Creedence Clearwater Revival 02:20 2. Cross-Tie Walker Creedence Clearwater Revival 03:20 DISC 13: 1. Tombstone Shadow Creedence Clearwater Revival 03:39 2. Down on the Corner Creedence Clearwater Revival 02:40 DISC 14: 1. Bad Moon Rising Creedence Clearwater Revival 02:19 2. Lodi Creedence Clearwater Revival 03:13 DISC 15: 1. Proud Mary Creedence Clearwater Revival 03:11 2. Walking on the Water Creedence Clearwater Revival 04:40 Creedence Clearwater Revival -“1969 Box Set” The 1969 Archive Box documents an unparalleled year of creative achievement by one of the world’s most enduring rock bands – Creedence Clearwater Revival. In this year alone, the band released 3 albums, had 4 hit US singles, performed on the Ed Sullivan show twice, toured the US and headlined the Woodstock Festival. Includes 3 x LPs, 3 x 7 EPs, 3 x CDs, posters, bumper sticker, 60 page booklet and more, all faithfully reproduced from original memorabilia. The item “Creedence Clearwater Revival 1969 Box Set New Vinyl With CD, With Bonus 7″ is in sale since Friday, July 29, 2016. This item is in the category “Music\Records”. 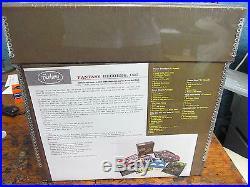 The seller is “get_importcds” and is located in Shepherdsville, Kentucky. This item can be shipped worldwide. CREEDENCE CLEARWATER REVIVAL 1969 Archive Box RSD 2016 SEALED NEW. HOW WE GRADE OUR RECORDS SS: Still Sealed, any defects such a “cut-out” holes will be noted in the description M : Mint, a brand new record. M-/MINT- : Means mint minus, no notable scratches or wear probably rarely played VG+ : A used, reasonable copy. There will be obvious signs of wear and the possibility of light surface noise between tracks or during quiet passages, but still quite nice. VG : Very Good – a used played copy. There will be obvious signs of wear and likely light to moderate surface noise between tracks or during quiet passages. VG- : Very Good Minus – significant wear and marks and usually quite noticeable surface noise. G+ : In the record grading world, “Good” is not good. >From here on down (Fair, Poor), we’re talking about beat-up records only guaranteed not to skip. This is the only trackable and insurable service we use. Records are removed from their jackets to protect against seam damage, kept in sleeves and placed in 4ML plastic outer bags. 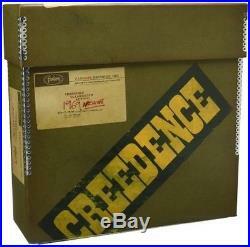 The item “CREEDENCE CLEARWATER REVIVAL 1969 Archive Box RSD 2016 SEALED NEW” is in sale since Tuesday, August 09, 2016. This item is in the category “Music\Records”. The seller is “walktodelphi” and is located in Columbus, Ohio. This item can be shipped worldwide.